Description: Beautiful cedar sided 3 bedroom 2 bath 1746 sq. 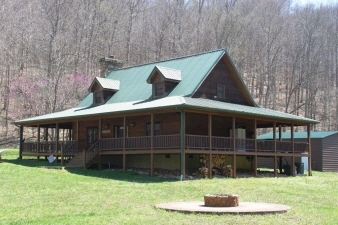 Ft. Home on 130 acres built in 2008. 1770 sq. Ft. Wrap around porch with 4 ceiling fans and speaker system. Large kitchen with custom cabinets, dining area, family room with stone fireplace. Wood ceiling,walls and floors through out. Master bedroom downstairs. Ceiling fans in all bedrooms and living room and dining area. Dual heating and air units. One for upstairs and one for downstairs . Newer 24 x 36 metal garage with 10 ft. Rolling doors. County water. Private yet only 10 minutes to town and interstate 75. Lots of deer and turkey. Seasonal creek. 3 ponds in the woods. Property backs to daniel boone national forest. Come listen to the turkeys gobble while relaxing on the porch. Data believed correct but not guaranteed. Buyer to verify data prior to offer. Agents read agent remarks.